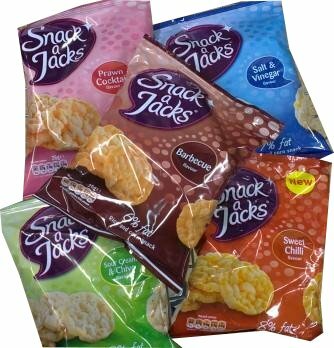 Snack a Jacks savoury Rice Cakes and Crunchy Curls are great tasting snacks with around 7% fat. They’re available in individual sized packs or multipacks. Snack a Jacks are ideal for helping with weight control as packs typically contain around 110 calories. But, if you’re looking to shave a few more calories off your daily intake, you’ll find the bags inside the multipacks bags have fewer calories. True, the packs are smaller, but you’d barely notice the absence of two or three rice cakes or crunchy curls. Take the Sour Cream and Chive flavour rice cakes. Sold individually as a 26g pack, you’ll be eating 108 calories. 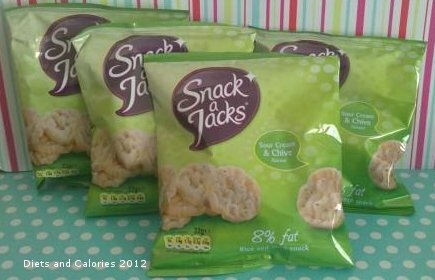 But swap for a 22g size from a multipack, and each bag contains 92 calories. It may not sound like much, but if you are calorie counting, every little bit helps. Likewise, switching from the 26g individual packs of Salt & Vinegar (106 calories) or the 26g Sweet Chilli (108 calories) to a 22g pack, brings the calorie count down to 89 and 91 calories respectively. So far, the BBQ, Hot Tomato and Prawn Cocktail flavours aren’t available in multipacks. But their calories for the 26g packs are 107, 106 and 107 calories respectively. If you prefer the Caramel flavour, you can also make a calorie saving here too. However, the sizing is slightly different. Individual packs contain 30g and have 122 calories. But purchased as one of a multipack brings the pack size down to 25g and the calorie count to 102. 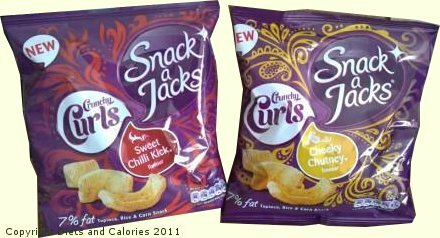 The Snack a Jack Crunchy Curls, available in flavours Cheeky Chutney and Sweet Chilli Kick, are sold in individual 22g packs or 18g as part of a multipack. These are already suitably low in calories, having just 88 per 22g pack and 72 calories per 18g pack. 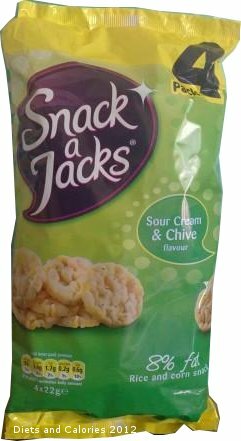 Nutrition Information per 22g pack Sour Cream & Chive: 92 calories,1.7g protein, 17.2g carbohydrates, 1.4g sugars, 1.7g fat, 0.2g saturates, 0.3g fibre, 0.60g salt. Suitable for vegetarians. Hi, are these baked or fried?